They said, "In everything, there's an opposition." These saying is the best to describe what four airlines do as a counter to the US Department of Homeland Security's ban on large electronic that covers nine airlines. 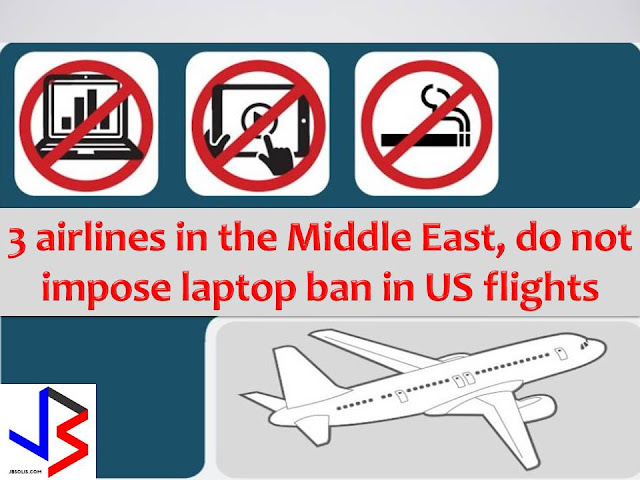 Under the ban, passengers are not allowed to bring any electronic devices larger than a cell phone into the cabin of non-stop flights to the US from 10 airports in the Middle East and North Africa. We all know that many travelers are inseparable with their gadgets. While the US and the British government impose the electronic ban, there are airlines who actually work hard to counter it. 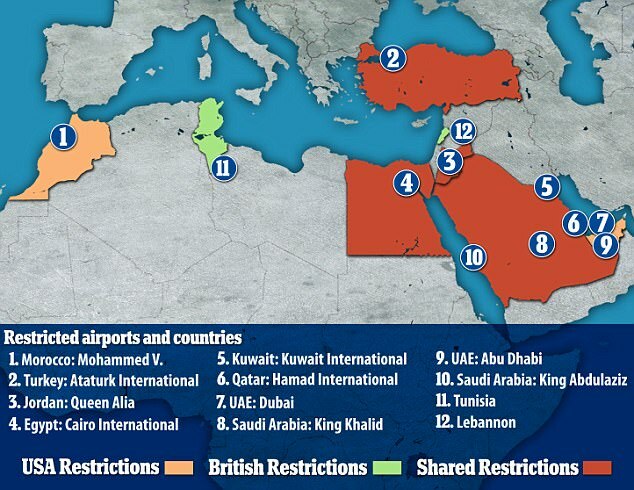 These airlines include Emirates, Qatar Airways, Etihad, and Turkish Airlines. These four airlines also represent the first-, second-, sixth-, and seven-ranked carriers in the world according to respected consumer-aviation website Skytrax. Instead of following the electronic ban of US, Emirates announced a service that will allow passengers to use their laptops and tablets until it's time to board their US-bound flights instead of checking them with their luggage. Prior to boarding, passengers hand over their laptops and other electronic devices to staff members to who pack them in secure boxes before storing them in the cargo hold. Emirates Airline president Sir Tim Clark said this is to ensure compliance with the new rules while minimizing disruption to passenger flow and impact on customer experience. "Our new complimentary service enables passengers, particularly those flying for business, to have the flexibility to use their devices until the last possible moment." Turkish Airlines has joined Emirates with a similar laptop handling policy. According to Turkish, passengers' electronic devices will be packed in secure boxes at the departure gate. Once in the US, the boxes will be returned to them by the airline. To ensure security, airline employees will personally return each box to its rightful owner by matching baggage tag numbers. In addition, Turkish Airlines announced on Twitter this week that passengers who turn in their laptops and tablets at boarding would receive free WiFi on board the flight. Skytrax has named the Istanbul, Turkey-based carrier Europe's best airline six years in a row. Saudia also tweeted that all passengers going to or returning from the US and UK will get 20 MB of free WiFi access. Aside from those airlines, Etihad joined the group by announcing that first and business class passengers on flights to the US will have access to complimentary WiFi and loaner iPads. "Wi-Fi vouchers will be distributed by our cabin crew onboard, providing free Wi-Fi for the duration of the flight. In addition, we’ll have iPads available for those that need them. Power and USB sockets at every seat will help keep devices charged." On the other hand, Qatar Airways offered its business class passengers free loaner laptops along with an hour of free WiFi on all of it's to the US. 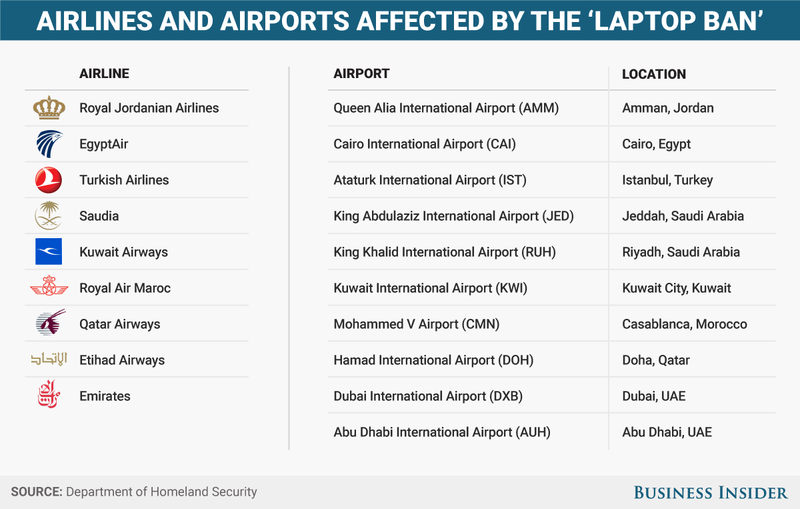 "By providing this laptop loan service we can ensure that our passengers on flights to the US can continue to work whilst onboard," Qatar Airways Group's CEO, Akbar Al Baker, said in a statement. "This unique ability to offer 'business as usual,' above and beyond the competition, is yet another example of Qatar Airways justification for being the 'World's Best Business Class.'" Pakistan International Airlines is another airline that contradicts the electronic ban.